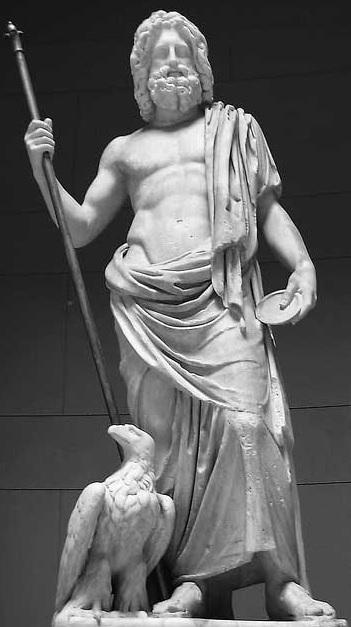 Jupiter/Zeus. The eagle, Aquila, was a symbol of Rome. A graven image of the Aquila was carried by the Roman legions into battle. The Literal Fulfillment of the Abomination that Causes Desolation: The Abomination that Causes Desolation is the Greek and Roman Armies with their Idols to Foreign Gods that Caused the Desolation of Israel. Mark 13:14 and Luke 21:20-21 record Jesus’ words during the Olivet discourse very similarly. The biggest difference between these two gospels is that instead of saying, “When you see ‘the abomination that causes desolation’ standing where it does not belong . . . .” as Mark does in Mark 13:14, Luke says, “When you see Jerusalem being surrounded by armies . . . .” The implication of this difference is that rather than using the epithet the abomination that causes desolation as Mark does in Mark 13:14, Luke appears to be defining the abomination that causes desolation. The abomination that causes desolation is a term used to describe idolatrous armies that have caused or are expected to cause the desolation of Israel. Judah Maccabee in an 1860 woodcut. Graven images and foreign gods are an abomination according to the Law of Moses. The spiritual presence of the deity in the idol was expected to ensure martial victory to its devotees. Through faith in their idols of Zeus, two pagan armies caused the desolation of Israel. The Greeks were the first to do so in the second century B.C. 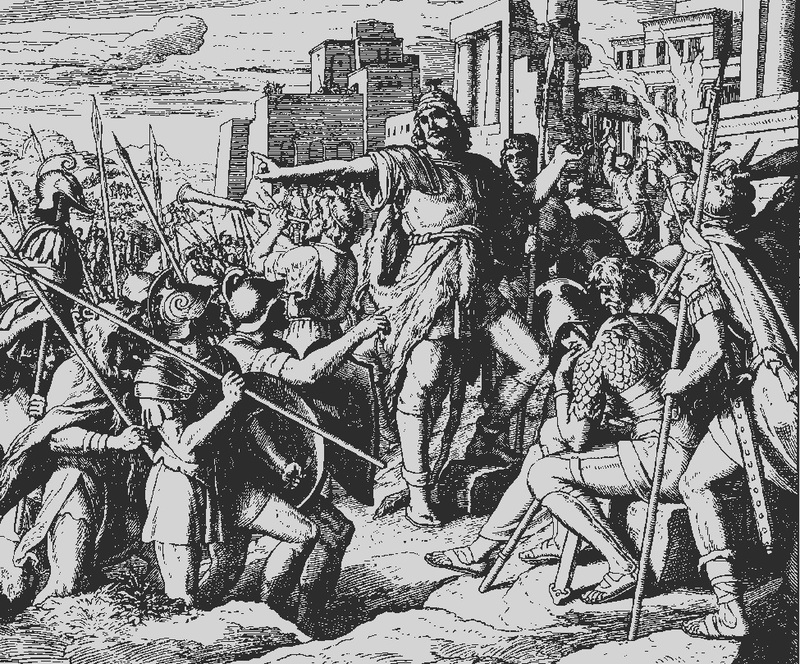 during the Maccabean Wars. Then in the first century A.D., the Romans caused even greater havoc during the Jewish War. The abomination that causes desolation is the Greek and Roman armies with their pagan idols of Zeus and Jupiter on their ensigns that literally caused the desolation of the Holy Land. After making Jerusalem desolate, the Greeks converted the temple in Jerusalem into a temple to Zeus as a gesture of thanks and honor to their god. The Romans did the same. After the second Jewish revolt, the Romans built a temple to Jupiter, the Roman name for Zeus, on the site in which the former Temple once stood. The Literal Fulfillment of the Abomination that Causes Desolation: During the Maccabean Wars, the Greek Army laid waste to Jerusalem and placed an Idol of Zeus on the Temple Altar. The abomination that causes desolation is a term used in the Bible to refer to both the Maccabean Wars in Daniel 11:31 and the Jewish War at the end of the age in the remaining verses. 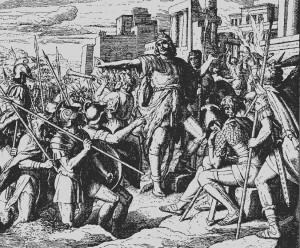 During the Maccabean Wars of the second century B.C., the Greeks attacked Jerusalem causing a great slaughter in the city. They then offered a pagan sacrifice atop the altar of burnt offering (1 Macc 1:59). It is also possible that an idol or image of Zeus adorned or was set on the Temple altar as the Temple was dedicated to Zeus (2 Macc 6:1-2). This act is referred to as “a desolating sacrilege” in 1 Macc 1:54. The Greek massacre of the people of Jerusalem and the pagan sacrifices to their idols in the Temple is the abomination that causes desolation in Daniel 11:31. The abomination that causes desolation at the end of the age was almost identical. In A.D. 70 the Romans worshipped their ensigns, the main one being Zeus’ messenger Aquila, by offering sacrifices to them in the Temple. In other words, these two acts were very similar. In the first abomination that causes desolation the Greeks set up and idol of Zeus and offered pagan sacrifices in the Temple. In the abomination that causes desolation at the end of the age the Romans did the same! Thus it is no surprise that the same term is used to describe both events. 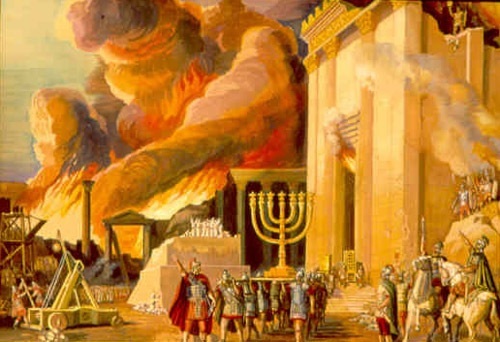 The Literal Fulfillment of the Abomination that Causes Desolation: During the Jewish War, Rome laid waste to Israel and worshiped the Ensign called the Aquila, an Idol of Zeus and Rome, on the Eastern Gate of the Temple. During the Jewish war with Rome in the middle of the first century A.D. the idol of Zeus was the Aquila, the chief ensign of the Roman army. Aquila is an eagle who carried Zeus’ lightning bolt and served as Zeus’ messenger.1 The ensigns were more than military flags or standards signifying Rome and its many legions, the ensigns were idols in the most literal sense of the word as they were regularly worshipped by the soldiers of the Roman army. 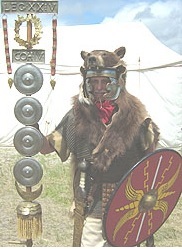 In fact, the Roman army worshipped and offered sacrifices to the ensigns on the eastern gate of the Temple in A.D. 70, an event, as shall be shown below, that had long been foretold in Biblical prophecy.2 Thus the ensign called the Aquila is in a sense an idol of Zeus himself while doubling as the national symbol of Rome just as the bald eagle is the national symbol of the United States. The Aquila was generally depicted holding Zeus’ lightning bolt in its claws. The main ensign, the Aquila, was typically depicted carrying Zeus’ the lightning bolt in its talons. Amidst the siege of A.D. 70 the Roman army likely fired firebrands into Jerusalem. 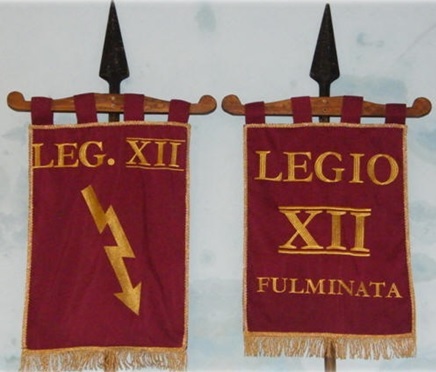 These firebrands, the Aquila clutching Zeus’ lightning bolt, and the Legio XXII Fulminata, “the Thunderbolt 12th Legion,” whose emblem, not surprisingly, is a lightning bolt are collectively the “fire from heaven” mentioned in Revelation 13:13-15. The fact that Titus called down fire from heaven in fulfillment of Revelation 13:13-15 not only links him to Elijah, and thus the false prophet of Revelation 19:20, it also metaphorically portrays him as something like the human embodiment or earthly counterpart of Zeus, the thunder god. Let us now take a look at how these pagan armies with their idols of Zeus fulfill all Bible verses about the abomination that causes desolation. Titus also calls down fire from heaven in fulfillment of Revelation 13:13-15 through the command of the 12th Legion who aided in burning Jerusalem and its temple. The emblem of the 12th Legion is a lightning bolt—fire from heaven. The Abomination that Causes Desolation in Daniel 9:26-27: In the Middle of the Seven-Year Long War with Rome, the Roman Army under Titus, the Future Emperor of Rome, besieged Jerusalem, put an end to Sacrifice and Offering by destroying Jerusalem and its Temple, and Set up Idols of Zeus, Caesar and Rome on the Eastern Wing of the Temple. The siege of Jerusalem divided the Jewish War into fairly equal 3.5 year intervals. 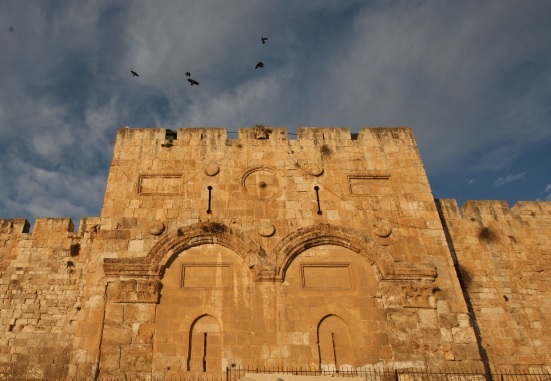 During this siege, the Romans destroyed the city and sanctuary and worshiped idols on the eastern gate of the Temple. Israel revolted against Rome in A.D. 66. Approximately, three and a half years later, the Roman army under the general and future emperor Caesar Titus, besieged Jerusalem. When Titus began his siege of Jerusalem he had just recently acquired the title Caesar and upon his father’s death in A.D. 79 was crowned the next emperor of Rome. Thus Titus, the general of the Roman army at the siege of Jerusalem who later became the next emperor of Rome, is the “ruler who will come” mentioned in Daniel 9:26. Many Bibles like the NASB translate “the ruler who will come” as “the prince who is to come.” This prince is Titus who was quite literally a prince during the siege of Jerusalem since he was the firstborn son of the then reigning emperor, Vespasian. Under the leadership of Prince Titus, the Roman army destroyed Jerusalem and its Temple in A.D. 70 in explicit fulfillment of Daniel 9:26: “The people of the ruler who will come will destroy the city and the sanctuary.” After Titus destroyed the temple in Jerusalem, the sanctuary mentioned in v. 26, he also literally fulfilled Daniel 9:27 “In the middle of the ‘seven’ he will put an end to sacrifice and offering.” After Titus destroyed the Temple in A.D. 70 it was never rebuilt and as a result the Jews never again performed the sacrificial offerings to the Lord. But what about the fact that v. 27 predicts that this was to happen “[i]n the middle of the ‘seven’”? The “seven” of v. 27 is a seven-year period. Most preterists mistakenly assume that the Jewish War ended in A.D. 70. This is historically inaccurate. The first Jewish revolt against Rome officially ended at the fall of Masada. In other words, the Jewish War was approximately seven and a half years long as the Roman assault began in Tishri of A.D. 66 and ended at the fall of Masada in Nisan of A.D 74. Thus there were three and a half years from the arrival of the Roman Army (Tishri of A.D. 66) until the start of Titus’ assault on Jerusalem (Nisan of A.D. 70). Then in fulfillment Revelation 9:10, Jerusalem was besieged for five months at which time vs. 26 and 27 were fulfilled including the setting up of the abomination that causes desolation, the destruction of Jerusalem and the Temple, and the permanent cessation of Temple sacrifice. Then after the fall of Jerusalem another three and a half years transpired until the conquest of Masada on Passover of A.D. 74, the official end of the war.5 In other words, the “middle of the ‘seven” in v. 27 appears to have been the five month period, of Revelation 9:10, in the events of v. 27 all took place. Thus the siege of Jerusalem literally divided the Jewish War into two equal three and a half year intervals whose sum, of course, equals seven years. Thus the seven year covenant spoken of in v. 27 appears to be fulfilled in the Jewish War itself. The ensign called the Imago was a graven image of Caesar. This was the image of the beast in Revelation 13:14-15. This abominable worship served as a dark reminder of Ezekiel 46:1-2. In Ezekiel 46:1-12, the prince of Judah was instructed to enter the eastern gate of the Temple and offer sacrifices to the Lord. The fact that Titus also offered sacrifices on the eastern gate of the Temple may have been an intentional act meant to send a message to his enemies that he is the new prince of Israel. As mentioned above, this, of course, is a fitting title for Titus, the son of the emperor and the one responsible for subjugating Israel under Roman dominion yet again. 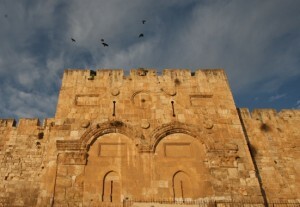 After being destroyed by the Romans, the Byzantines rebuilt the eastern gate of the Temple depicted here. The Abomination that Causes Desolation in Daniel 11:31: During the Maccabean Wars, the Greek army desecrated the Temple, stopped the regular sacrifice and placed an Idol of Zeus on the Temple Altar. The Abomination that Causes Desolation in Daniel 12:11: 1,290 days from the Termination of the regular Sacrifice to Caesar in A.D. 66, the Roman army, the Abomination that Causes Desolation, arrived at Jerusalem in Shabbat of A.D. 70. At the end of Tammuz or the beginning of Ab of A.D. 66, Eleazar abolished the “regular or daily sacrifice” to Caesar which Josephus says, “[W]as the true beginning of our war with the Romans.”10 1290 days from this act of rebellion ends on Shabbat of A.D. 70, the month and year in which the Roman army arrived outside of Jerusalem preparing to lay siege to the city. As stated above, the Roman army with its idols of Zeus, Caesar and Rome are the abomination that causes desolation. Therefore it seems possible that there were, in fact, 1290 days from the cessation of the “regular sacrifice” to Caesar to the “setting up” of the abomination that causes desolation, the settling of the abominable Roman armies with their idolatrous ensigns outside of Jerusalem. The Abomination that Causes Desolation in Daniel 12:12: Prophecies in the Bible Often Have Dual Fulfillment. The 1,335 Days Prophecy may be an Example of One of These Prophecies. Biblical predictions frequently have dual fulfillments, an immediate typological fulfillment and a subsequent antitypical fulfillment. One well-known example of this dual fulfillment is the child who was born of a virgin mentioned in Isaiah 7:14. This prediction was initially fulfilled in Isaiah 8:3 when the prophetess gave birth to a boy. This prophecy then appears to have been later fulfilled in the birth of Christ. I believe Daniel 12:12 may be another prophecy that was fulfilled more than once. The Abomination that Causes Desolation in Daniel 12:12: There were EXACTLY 1,335 Days from the Abolition of the Daily Sacrifice to Caesar in Av of A.D. 66 until the beginning of the Siege of Jerusalem on Passover of A.D. 70. The Abomination that Causes Desolation in Daniel 12:12: There were also EXACTLY 1,335 Days from the 9th of Av of A.D. 70 when the Roman Army worshiped Idols of Zeus, Rome and Caesar on the Eastern Gate of the Temple until the First Day of Peace at the End of the Jewish War on the 16th of Nisan in A.D. 74. 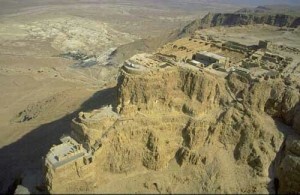 The Fortress of Masada. In this mountain the Jews put up their last stand after the fall of Jerusalem. The Abomination that Causes Desolation in Mark 13:14, Matthew 24:15-16, and Luke 21:20-21: The Arrival of the Roman Army with the Idolatrous Ensigns is the Abomination that Causes Desolation Mentioned in the Olivet Discourse. This Event was a Sign to Flee the City. Mark 13:14, Matt 24:15-16, and Luke 21:20-21 all paraphrase Jesus’ words during the Olivet discourse. Notice that rather than saying, “When you see ‘the abomination that causes desolation’ standing where it does not belong . . . .” as Mark does in Mark 13:14, Luke says, “When you see Jerusalem being surrounded by armies (Luke 21:20). . . .” The implication of this change is that Luke seems to be defining the abomination that causes desolation as the Roman armies themselves. The Roman army with its idols to Caesar, Rome and Jupiter on the ensigns is the abomination that causes desolation. The Roman army is given this epithet because it an idolatrous abomination according to the Mosaic Law that ultimately left Israel desolate after the Jewish War. Jerusalem is often called the “holy city” (Daniel 9:24, Matthew 4:5 and Revelation 11:2). In Luke 21:20, Jesus warned, “When you see Jerusalem being surrounded by armies, you will know that its desolation is near.” The Roman army surrounded Jerusalem three times during Israel’s first century war with Rome. In Iyyar of A.D. 66, Gessius Florus entered Jerusalem with the Roman army and killed almost four thousand people in the city.16 Later that year Cestius surrounded Jerusalem with the 12th Legion.17 The third time the Roman army encompassed Jerusalem was in A.D. 70 under the command of Caesar Titus. The presence of the Roman army outside of Jerusalem in Iyyar and later in Tishri of A.D. 66 was Jesus’ sign to His people to quickly flee the city in fulfillment of Luke 21:20-21. The massacre that ensued in Iyyar of A.D. 66 in the Upper Marketplace immediately after the Roman army entered the city explains why Jesus told his people to drop everything and leave after seeing Jerusalem surrounded by armies in Luke 21:20-21. Similarly Cestius’ arrival to and abrupt departure from Jerusalem in Tishri of A.D. 66 preceded a violent civil war in the city. In both occasions those who failed to quickly leave Jerusalem after seeing these armies put their lives in great risk in fulfillment of Mark 13:14, Matthew 24:15-16, and Luke 21:20-21. Matthew 24:15 and the Abomination of Desolation: When Matthew 24:15 is read Word-For-Word Literally, that Portion of the Verse in Which Jesus alludes to the Abomination of Desolation Standing in the Holy Place appears to Be a Parenthetical Statement meant to link the Abomination of Desolation of Matthew 24:15 with that of Daniel 9:26-27. When this Portion of the Text is Read as a Parenthetical Statement, Jesus appears to be telling His People to Flee as soon as They SEE the Abomination of Desolation, Not when it had already entered the Temple. According to Matthew 24:15 the abomination that causes desolation was to stand “in the holy place.” Every time “holy place” occurs in the New Testament, it always refers to the Temple, not the city of Jerusalem. In his book Matthew 24 Fulfilled, John Bray says that in 2 Maccabees 2:18 Israel, the holy land, is called the holy place: “As he promised in the law, will shortly have mercy upon us, and gather us together out of every land under heaven into the holy place: for he hath delivered us out of great troubles, and hath purified the place.”18 However, even in this v. “holy place” just refers to the Temple as it was the Temple, not Israel as a whole, that was purified by the Maccabees during their war with the Greeks as is alluded to in 2 Maccabees 2:18. The gathering of all the Jews “out of every land under heaven” mentioned in this v. refers to the coming together of the Jews to the Temple to celebrate Israel’s holy feasts. Though “holy place” is always used Biblically in reference to the Temple, I do not believe that it is wrong to call Israel or Jerusalem, the holy land and the holy city, the holy place. When Titus entered the Temple and the Romans worshipped the ensigns at the eastern gate,19 it was too late to flee the city as the siege was nearly over and the Romans erected a wall around the city to prevent escape.20 Consequently many preterists believe the abomination that causes desolation was zealots in the Temple. However, the word-for-word Interlinear from Greek to English of Matthew 24:15 literally reads, “When therefore you shall see the abomination of desolation WHICH HAVING BEEN SPOKEN OF BY DANIEL THE PROPHET STANDING IN THE HOLY PLACE (Dan 9:26-27) THE ONE READING LET HIM UNDERSTAND then those in Judea let them flee to the mountains.” Did you see that? When Matthew 24:15 is read literally “which having been spoken of by Daniel the prophet standing in the holy place” seems to be a parenthetical statement! This phrase looks like an explanatory insert interrupting the sentence so as to link the abomination of desolation of Matthew 24:15 with the abomination of desolation mentioned previously in Daniel 9:26-27. There are many parenthetical statements in the Bible and because parenthesis did not exist in ancient times modern translators must use context clues to determine when to insert parenthesis. Matthew 24:15 must include a parenthetical statement because without it, Matthew 24:15 appears to contradict Luke 21:20-21, its synoptic equivalent. Luke 21:20-21 reads, “When you see Jerusalem being surrounded by armies, you will know that its desolation is near. Then let those who are in Judea flee to the mountains, let those in the city get out, and let those in the country not enter the city. [Emphasis mine.] (Luke 21:20-21) As stated above, Luke 21:20 appears to be defining the abomination that causes desolation as the Roman armies themselves. How could Jesus instruct his people to drop everything and flee when they see an army surrounding a city presumably so as to lay siege to it in one verse and then issue the same warning when this army is already inside the Temple? An invading army is not likely to enter a city quickly, usually a protracted siege like the one in A.D. 70 is required before an invading force is able to enter a fortified building inside the city like the Temple of Jerusalem. These two verses are irreconcilable when read in this manner since it makes no sense of the speed and urgency in which Jesus tells his disciples to flee. Thus for clarity Matthew 24:15 should read, “When therefore you shall see the abomination of desolation (which having been spoken of by Daniel standing in the holy place the one reading let him understand) then those in Judea let them flee to the mountains.” By inserting a parenthesis here, this parenthetical statement becomes more obvious to readers making it appear clearer that Jesus meant to tell his people to leave the city as soon as they “see the abomination of desolation,” not necessarily when it stands in the Temple. When read in this way Matthew 24:15 perfectly matches its synoptic equivalent in Lk 21:20-21: “When you SEE JERUSALEM SURROUNDED BY ARMIES, you will know that its desolation is near. Then let those who are in Judea flee to the mountains, let those in the city get out, and let those in the country not enter the city.” Thus in both Matthew 24:15 and Luke 21:20-21 Jesus tells His people to flee to the mountains when they first see the Romans. Fulfilled! Matthew 24:15 Commentary: Could the Abomination that Causes Desolation be Zealot Murder in the Temple? Another problem with this view is that the Zealots continuously desecrated the Temple with various abominable acts from A.D. 66 until A.D. 70. Thus one might ask at which moment throughout all these detestable deeds were the saints expected to drop everything and leave Jerusalem per Matthew 24:16-19? Or maybe Jesus intended to tell His people to flee as soon as the Zealots first defiled the Temple? This idea is just as problematic. How could Jesus tell his audience to drop everything and flee when the Zealots defiled the Temple in Matthew 24:15-19 and then when an army surrounds the city in Luke 21:20-21 when these signs were far from simultaneous? 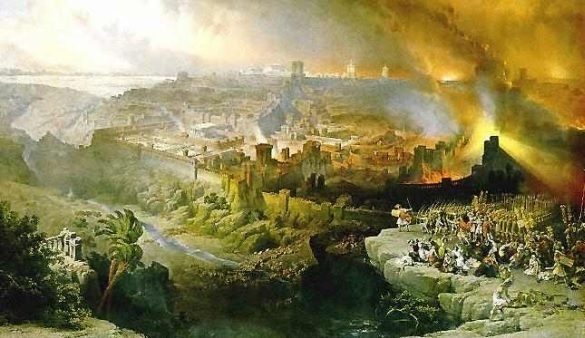 Preterism, the Abomination that Causes Desolation and the Beliefs of the Early Church: This Idea that the Abomination that Causes Desolation is the Roman Army and Their Idols of Zeus, Caesar and Rome was Not Uncommon in Early Church Writings. The fact that Eusebius says that the abomination of desolation remained in Jerusalem to his day appears to refer to the fact that the idol of Zeus, Caesar and Rome erected in the Temple by the Romans in A.D. 70 in a manner was set up in a more permanent way on the site of the old temple not long after its destruction by the Romans when a Temple to Zeus was built over the site of the former Temple. Jerusalem was conquered on the eighth day of Elul in A.D. 70. The rebels at Masada committed mass suicide on the 15th of Nisan in A.D. 74 approximately three and one-half years later assuming a 360 day Jewish solar year. See Josephus The Wars of the Jews 6.10.1, 7.9.1. John L. Bray, Matthew 24 Fulfilled, (Powder Springs, GA: American Vision Press, 2008), 58. Beatus of Leibana and Heterius, Epistle to Elipandus, Book 2, 101. PL 96:1028, cited in Gary DeMar and Francis X. Gumerlock, The Early Church and the End of the World, (Powder Springs, GA: American Vision, Inc., 2006), 87. Scholia on Matthew. On Matthew 24:15. PG 106:1151, cited in Gary DeMar and Francis X. Gumerlock, The Early Church and the End of the World, (Powder Springs, GA: American Vision, Inc., 2006), 87. Theophylact, Commentary on Mark. On Mark 13:14-17. The Explanation by Blessed Theophylact of the Holy Gospel According to St. Mark (House Springs, MO: Chrysostom Press, 1993), 112, cited in Gary DeMar and Francis X. Gumerlock, The Early Church and the End of the World, (Powder Springs, GA: American Vision, Inc., 2006), 87. Arnold of Villanova, On the Time of the Advent of Antichrist. In Heinrich Finke, ed., Aus den Tagen Bonfaz VIII. Funde und Forschungen (Munster: Aschendorff, 1902), CXXXIX, cited in Gary DeMar and Francis X. Gumerlock, The Early Church and the End of the World, (Powder Springs, GA: American Vision, Inc., 2006), 87-88. Eusebius Proof of the Gospel 2.138, cited in Gary DeMar and Francis X. Gumerlock, The Early Church and the End of the World, (Powder Springs, GA: American Vision, Inc., 2006), 20. Very comprehensive, insightful, and historic. Clarified a lot for me.